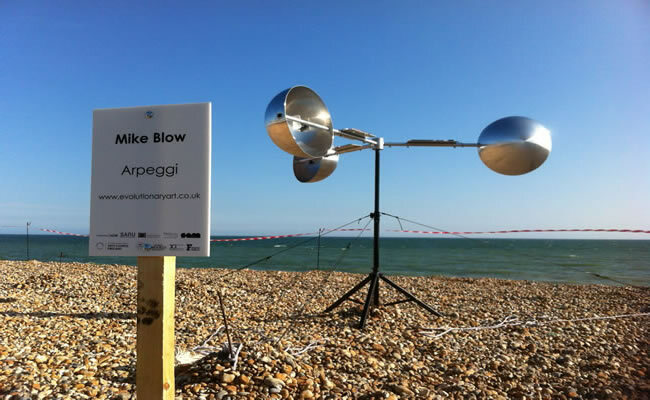 Mike Blow‘s artistic practice spans sound art, interactive art and performance, and is an ongoing exploration of his interests in electronic creativity, the study and modelling of natural processes and the artistic possibilities offered by intermedia spaces. Sound is a consistent element in all his work. Blow loves its physical, vital energy; its quality of appearing simultaneously present and absent, its enormous dynamic range and its capacity for shifting our perception of the environment. As a musician he has always had an interest in sound, but within the context of artistic practice this has broadened into an exploration of its spatiality, the musical quality of environmental sounds, and its ability to transform our understanding of an object, place or piece of film. More info on his website. We presented POD, a collaborative tactile sound sculpture realised with Alison Ballard, at the first Plymouth Art Weekender in 2015.